It may feel like it’s far too soon, but if you want to book one of the best Christmas party venues in Edinburgh then there’s really no time like the present. 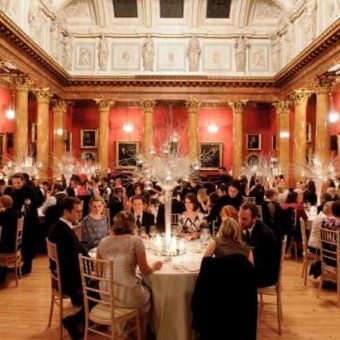 The task can be somewhat daunting, so we’ve brought you a list of party venues in Edinburgh where you can join other groups or hold your own private Christmas party. At the top of Edinburgh’s Royal Mile, the Hub offers a choice of three rooms, each with its own distinct character. Fine table linens and sparkling glassware see the contemporary café on the ground floor transform into a stylish dining area with dance floor, whilst the towering ceilings and vast arched windows of the Dundard Library create a blank canvass on which a Christmas scene can be beautifully painted. 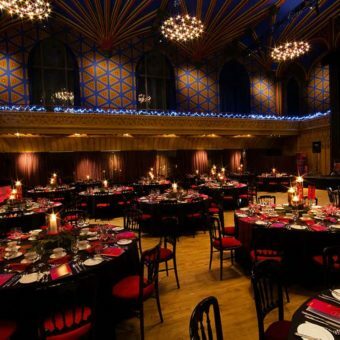 The piece de resistance of The Hub is the elaborately decorated Main Hall, which can be set for 300 diners and has a fully sprung floor, built in sound and lighting systems and a stage for a band or DJ to allow a spectacular transition between dinner and dancing or a ceilidh. 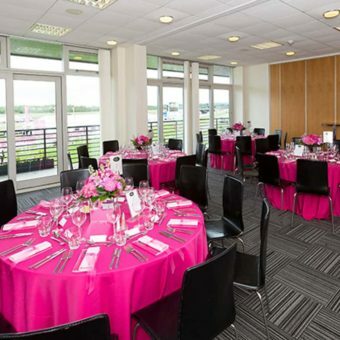 The modern Lothian Suite at Musselburgh Racecourse creates a sparkling atmosphere where guests can enjoy a traditional three course festive menu prepared by the award winning Heritage Portfolio. Celebrations continue with a party in the Owners and Trainers Marquee, where a DJ selects the perfect mix of party tunes to see guests celebrate until carriages at midnight. A clear evening provides guests with the opportunity to rest their dancing feet in the large lawned area adjoining the marquee, where they can gaze at the stars whilst relaxing on the modern outdoor furniture. 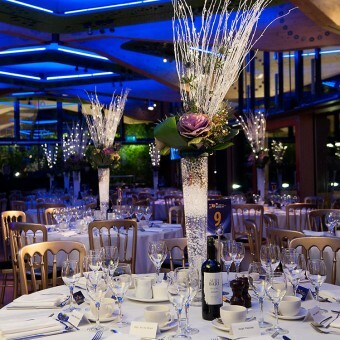 Lighting, music and festive decorations see the tranquil setting of The Gateway at the Botanic Gardens metamorphosize into a modern vibrant area where up to 350 guests can enjoy a Christmas menu created by the Royal Garden’s award winning chef. 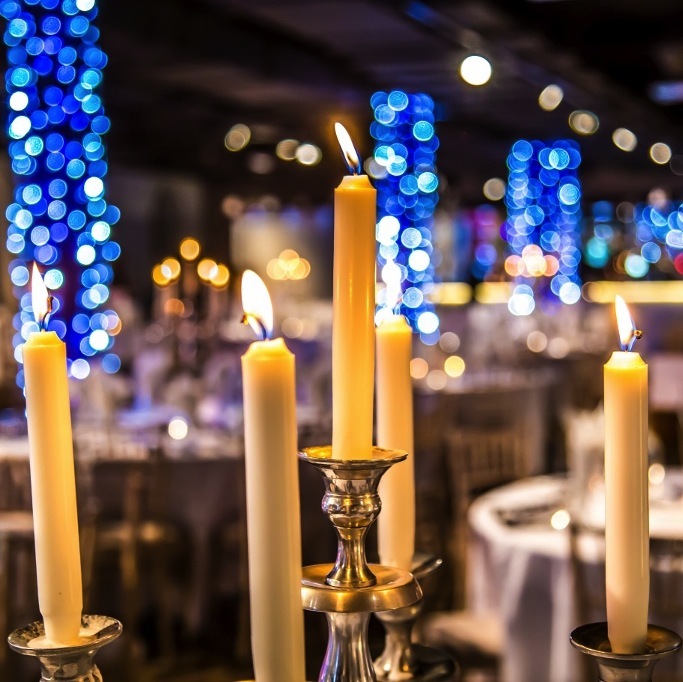 For smaller numbers, the elegant decorations see dining at the Caledonian Hall glow with Christmas cheer before guests move to the neighbouring pavilion for dancing or, on a crisp winter’s evening, after dinner drinks on the adjoining patio. The beauty and tranquility of the wonderful outdoor setting is not lost at night, when guests can meander through the outdoor light show, drink in hand, creating a wonderful addition to celebrations. 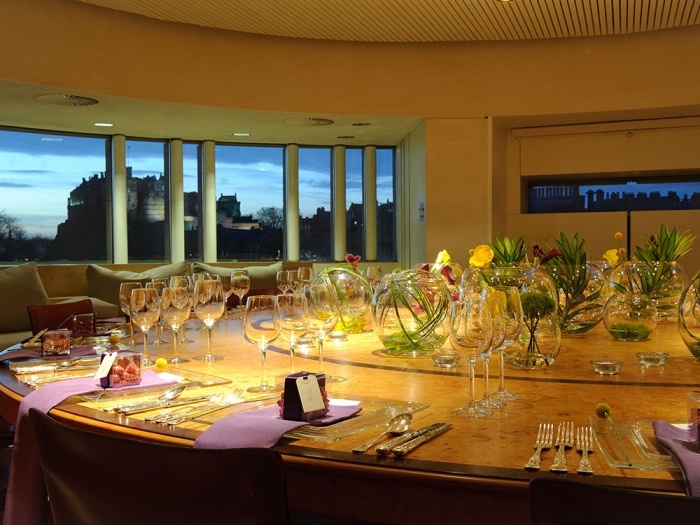 A feeling of warmth and tradition make the Royal College of Physicians an ideal venue for celebrations in a choice of three stunning areas of varying sizes. Upstairs, the Cullen Suite exudes sophistication for an elegant festive meal and, being split into separate parts, allows the smooth transition between a sparkling drinks reception, dining and dancing. The grandeur of the Great Hall, with towering pillars and intricate plasterwork, creates an air of sophistication and is large enough to accommodate 150 diners for a yuletide celebration. Dating back to the 1870s, a cosy atmosphere is brought to the New Library by the beautiful antique bookcases which line the room, together magnificent marble fireplaces and a stunning domed ceiling, whilst its surrounding gallery is ideal for musicians or carol singers. A sparkling wine reception creates a celebratory mood, before guests are invited to enjoy a sumptuous three course traditional Christmas menu, accompanied by a half bottle of wine per person. Celebrations continue into the early hours with a disco before carriages at 1:00. Fifteen miles outside Edinburgh, Eskmills offers shared party nights in the former Victorian fishing net factory, which has been lovingly converted into a contemporary venue. 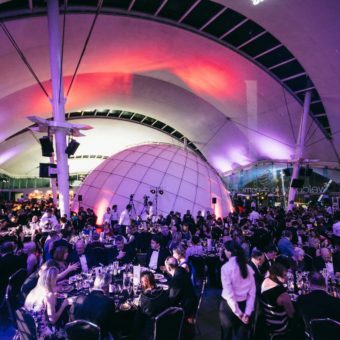 Party-goers will begin celebrations with a cocktail on arrival, followed by canapés, a delicious three-course meal and dancing until 1:00 in the morning in the festively decorated venue. 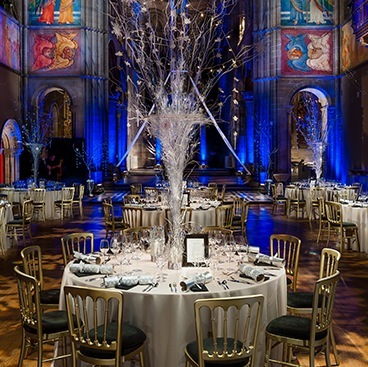 The ethereal majesty of Mansfield Traquair is transformed into a celebratory party venue with music and lighting illuminating the soaring pillars and ceiling of “Edinburgh’s Sistine Chapel”. Festivities begin with a glass of Cava, followed by a three-course meal with two glasses of wine, tea or coffee and petits fours. To continue celebrations there’ll be bar facilities available and a DJ until midnight, all set to a Christmas theme. Want to give the gift of Edinburgh? Browse our carefully curated selection of Edinburgh gifts.